It's here! 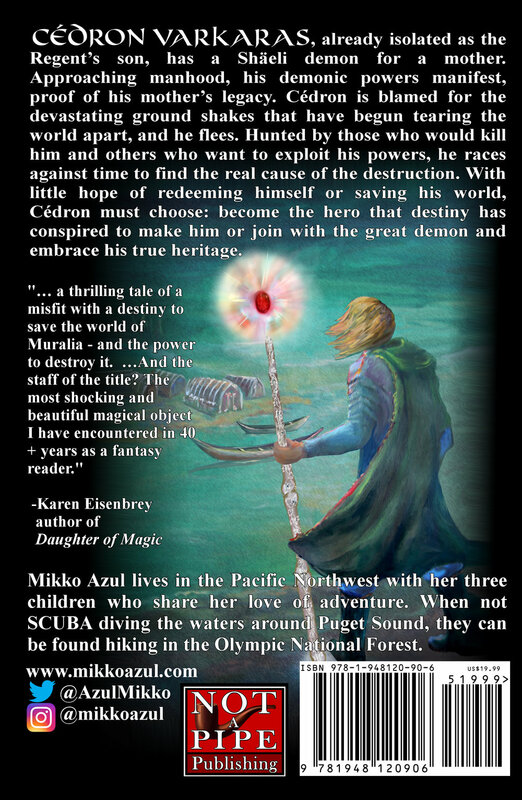 Mikko Azul's epic fantasy, The Staff of Fire and Bone, is now available for pre-order. Check out this beautiful cover! Mikko Azul’s stunning epic fantasy novel, The Staff of Fire and Bone, will hit shelves on the 30th of January in hardcover, trade paperback, and on Kindle. Azul, a former Marine and mother of three, has been working on the novel since 2005, and she gained renewed inspiration when an earlier version of the manuscript won awards and recognition at the San Francisco Writers Conference. She then signed with Not a Pipe Publishing, a small press in Independence, Oregon and the first publishing company in the United States to announce their acceptance of author Kamila Shamsie’s challenge to make 2018 “The Year of Publishing Women.” Azul’s The Staff of Fire and Bone will be the first of nine novels released by the company in 2018. The early critical reception has been effusive. Karen Eisenbrey, author of The Gospel According to St. Rage and the forthcoming Daughter of Magic, writes, "The Staff of Fire and Bone is a thrilling tale of a misfit with a destiny to save the world of Muralia - and the power to destroy it. Like the best fantasy settings, Muralia feels both familiar and deeply strange. And the staff of the title? The most shocking and beautiful magical object I have encountered in 40+ years as a fantasy reader."